Their Royal Highnesses the Earl and Countess of Wessex visited Gibraltar in June 2012 as part of Her Majesty the Queen’s Diamond Jubilee celebrations. During their stay they visited many parts of Gibraltar and met a cross-section of people from across the local community. Arriving at lunchtime on Monday 11th June, their Royal Highnesses were met by His Excellency the Governor and the Chief Minister of Gibraltar. The Royal couple then drove across the runway to RAF Gibraltar to inspect a Tri-Service Guard of Honour. At around 12.30 after a short ‘walkabout’ in John Mackintosh Square, Their Royal Highnesses watched excerpts from the Gibraltar Academy of Dance’s production of ‘An Audience with the Queen’ on a specially-erected stage in the Square. A walk along Main Street to the Convent took place thereafter where the people of Gibraltar turned out en masse to welcome the Royal couple. At the Convent, their Royal Highnesses planted a tree and unveiled a plaque in honour of their visit and the Queen’s Diamond Jubilee. At a public ceremony later that day the Royal visitors laid the foundation stone for the Diamond Jubilee Monument on Line Wall Road where it overlooks the site of the new Jubilee Commonwealth Park. They then moved on to a reception at King’s Bastion meeting representatives of all of Gibraltar’s sports associations before attending a Gibraltar Government dinner later that evening as guests of honour at the Rock Hotel. Tuesday’s programme included a visit to HQ British Forces; the unveiling of a plaque on the Moroccan Fountain in Alameda Gardens to honour Moroccan Workers in Gibraltar and a visit to the Gibraltar Museum. That afternoon, they drove to the Upper Rock with a stop at Queen’s Lookout to meet several local people involved with Her Majesty the Queen’s visit in 1954 and then what proved to be a fascinating visit to ‘Stay Behind Cave’ - had Germany invaded Gibraltar in WWII a small number of men would have remained on the rock, buried alive inside this cave with provisions for up to a year with the mission to radio intelligence back to London about German shipping manoeuvres. The opening of a children’s playground at the Moorish Castle housing estate was next on the list on the way down from the Upper Rock, included together with other estates to enable the Royal visitors to meet a real cross-section of Gibraltarians from all walks of life. In the evening, Their Royal Highnesses attended the Queen’s Birthday Parade in Casemates Square followed by the Queen’s Birthday Party at the Convent where again they were able to meet a cross-section of the community including our very own designer/photographer Stephen Perera who presented HRH The Countess of Wessex with framed stamps of the couples Royal Wedding in June 19th 1999 and the ‘Royal Grandchildren’ issue which featured their two children. As well as public events, Their Royal Highnesses presented Duke of Edinburgh awards and met local religious leaders. Their itinerary also included visits to the Mission for Seafarers, the Port Authority and the new Gibraltar law courts. The Earl also visited GibDock (Gibraltar’s docks) and the two rowing clubs where he named a new boat and presented regatta awards whilst the Countess’s busy programme included visits to the Girl Guides’ HQ and to St Martin’s School. 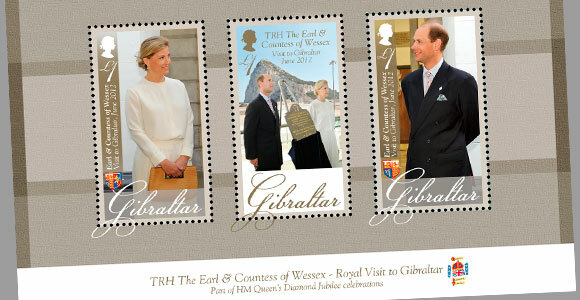 Having visited the Laguna housing estate on Wednesday morning, the Royal couple toured the airport’s new terminal building unvieling a plaque (depicted in the stamps) and where they were presented with the symbolic ‘keys of Gibraltar’ by the Chief Minister, Fabian Picardo as a gift from the people of Gibraltar. His Excellency the Governor and the Chief Minister then say their farewells before the Royal visitors boarded their flight back to London.